Don’t Forget your companion animals when planning your estate! C & W Rustic Hollow Shelter has established a Safety Net Program to take the worry out of your pet’s future. This program was created to give you a ‘safety net’ and security in knowing your pet(s) will be cared for in a loving environment in the event of your death or inability to provide care to your companion animal. Our Safety Net Program is to ensure that your wishes for your pet’s future are respected if something would happen to you unexpectedly, or upon your death’s in the future. Your companion animal would have a place to live out their life times at our sanctuary. The program helps you plan for your pets future and gives you peace of mind and a ‘safety net’ to know your animals will be cared for. We recommend talking to your lawyer/financial advisor who can advise you about the methods of giving that are the most beneficial and appropriate for you. Then you can contact us so we can help you find the best way to help your animals. If you are planning or have planned your wills they can be amended to include our sanctuary (if you choose to have your pets come here). There are several types of bequests: specific, residual or percentage. A specific bequest is a gift of one piece of property, such as stock from one company, etc., a piece of real estate or a stated sum of cash. A residual bequest states that C & W Rustic Hollow Shelter, Inc. would receive the full amount or part of the remaining value of an individual’s estate after all debts, taxes, administrative expenses and specific bequests have been taken care of. Finally, a percentage bequest specifies the fraction or percentage of an estate to be donated. Another way is to make C & W Rustic Hollow Shelter beneficiary to a life insurance policy. Life insurance monies go directly to the recipient without going through estates. All of these acts of giving have specific tax credits and we recommend you contact your lawyer/financial planner for what works best for you. Please contact Carmen by email at cwshelter@wildblue.net or call 641-435-2036 for information on an appropriate amount to help care for your companion animals, which depends on how many animals you have that may need a safety net for in case something happens to you, their primary caregiver. We primarily give life-time care to felines but talk to us about your dogs as well. WE ALSO STRONGLY SUGGEST that before choosing a sanctuary for your animals, that you VISIT THAT SANCTUARY. Plan a trip and check out the facility! This is very important. Visit C & W and see if our sanctuary is the right place for your companion animals. If it is, you will not only have a ‘safety net’ for your animals, but it will help C & W continue to grow and expand. For peace of mind that your pets will be cared for when9you are gone. Built in 2007, this building stands as proof of one more options for your companion animals. Sandra McIntire built a building on C & W property and paid for all of the construction and lifetime care of her 14 felines. C & W rests on 80 acres of shelter owned land and grassland with lots of flowers and birds and squirrels to watch. To Sandy, who was at the end of her life, Rustic Hollow seemed like the perfect place to build a dream home for her furballs. And build it she did. 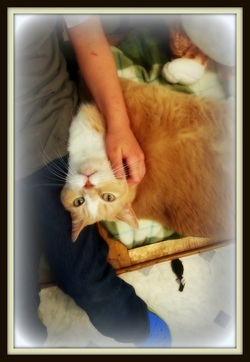 All of her felines are very comfortable in their 'home away from home' at Rustic Hollow and get lots of attention. Some of her felines were feral kitties she rescued form the streets and she did not want any of her cats to ever be separated. When all of her felines have passed over the Rainbow Bridge, the building will then belong to C & W. In the meantime, Sandy's kits reigned royally in their home at C & W. Just ask Dusty (pictured above and below (Right) and Pinkie, two of Sandy's kitties that have been at Rustic hollow for over five years now. As of 2019, only one of her felines still is in residence, Dorian.